You can be sure of two things when Autumn arrives. First of all, everyone will drink a Pumpkin Spice Latte, cause it`s the epitome of Fall. Second of all, everyone will start reading thrillers/ horror novels. I`ll admit, I don`t often reach for mystery novels, but I am more inclined to read them during this season. Last year I picked up my first Agatha Christie mysteries, and reading them was such a wild ride. Man, that lady could write! I`m pretty sure her books are considered classics by now, so sometimes it's nice to read more contemporary novels. 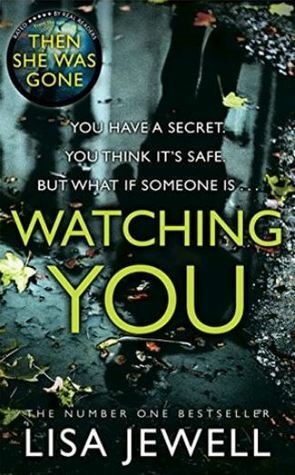 With that in mind, I decided to pick up "Watching You" by Lisa Jewell. I got a hardback copy for 6£ in Sainsbury's, so I thought why the hell not? It was cheap, and the premise sounded interesting. "But what do you do with an unattainable crush once it`s yours to keep? What does it become? Should there perhaps be a word to describe it? Because that`s the thing with getting what you want: all that yearning and dreaming and fantasising leaves a great big hole that can only be filled with more yearning and dreaming and fantasising. And maybe that`s what lay at the root of Joey`s sudden and unexpected obsession with Tom Fitzwilliam. Maybe he arrived at the precise moment that the hole in Joey`s interior fantasy life needed filling". The story starts with a bang: there`s been a murder, but you`re not aware of the identity of the victim or the criminal. You`re then taken a few weeks back and introduced to a complex array of characters. I know that some people found this confusing, but I`ve enjoyed the multiple omniscient POVs. The action takes place in a small, posh neighbourhood in Bristol, and you just know that nothing is as it seems. Behind the beautiful walls, people hide rotten secrets. Almost everyone gives stalker vibes, and it`s hard to find a character that`s completely redeemable. I suppose creepy characters is a thriller/ mystery trope that`s still going strong. I must say, I found the teenagers in the book more compelling than the adults. For starters, I couldn`t stand Joey. She`s a bit of a screw-up: she got married to a guy she met in Ibiza, she currently lives with her brother and she can`t get a decent job. I don`t know if we were meant to sympathize with her, maybe a better background story would have done the trick. As soon as she moves in with her brother, she becomes obsessed with her neighbour, high-school teacher Tom Fitzwilliam. Although I had a few eye-rolls, I liked the fact that the story seems to go in one direction, only to change course a few chapters later. Whilst the adults act like teenagers, it`s actually the kids that have more common sense. Like I said earlier, Joey`s chapters weren`t my favourite, but I enjoyed the other two perspectives, from Freddie and Jenna. If I were to choose my favourite character, I would say without a doubt, Jenna. Her mum struggles with mental illness, and it`s up to Jenna to be the grown-up. Being one of the most popular girls at school, Jenna has a reputation to maintain, and I loved the parallels between her behaviour at school and her behaviour at home. And even though he does some questionable things, I liked Freddie, Mr Fitzwilliam`s son. Despite the creepy attitude, he`s a sweet kid, and his actions are crucial to the overall story. All in all, I gave this book 3.5 stars. I did not see the ending coming, but after finishing it, there were too many coincidences for my liking. Also, it`s not technically a spoiler, but I would have liked for the murder to be premeditated. I have issues, I know. But the thing is: I felt bad for the criminal. I`m not saying that the victim had it coming, but it would have been more interesting if it were a revenge murder. Anyway, despite my minor complaints, it was a well-written book, with interesting characters and an eerie ambience. Definitely recommend it as a Halloween read. I liked the book, but thank you for sharing what you thought. Thank you for coming by my blog and commenting. I hope to visit your blog more often. Going to follow by e-mail.